Skin bleach dangers are very real. Dark spots, also known as age spots or hyperpigmentation, are caused by the harmful rays of the sun or genetics. As people grow older, these spots become problematic. Women in particular are prone to try to lighten facial blemishes or spots that are left behind from acne, burns, chicken pots, stretch marks or other irritations that can result in skin discolorations. Most women seek to have an even, blemish-free skin tone, and skincare product marketers advertise skin whitening or lightening creams to smooth away discolorations for an even complexion. It is important to know, however, that chemicals that are used to bleach or lighten your skin can be harmful because some common ingredients in skin lightening products have been linked to cancer. 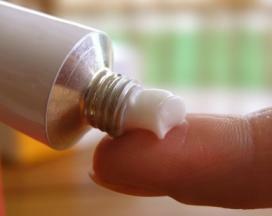 Hydroquinone is a primary ingredient found in most skin bleaching creams today. Hydroquinone has been found to be a carcinogen during studies using laboratory mice, according to Medicine.net. Used for years in skin lightening solutions, products containing up to two percent of hydroquinone are available over the counter. Oftentimes, however, consumers either do not know about or are willing to ignore the dangers associated with using skin bleaching solutions. Those who ignore skin bleach dangers feel that having a lighter complexion or clear skin tone is worth the risk. In the United States, consumers believe that products sold in stores are safe because of safety regulations imposed by the government. In fact, it has been reported that products containing hydroquinone were to be pulled from store shelves and require a prescription for use in the United States, according to Medicine.net. Dermatologists, however, fought back, stating that the ingredient is safe. The use of "hydroquinone has been linked with ochronosis", a skin problem characterized by thickening of the skin and discoloration, the Medicine.net article states. Potential userd of skin bleach should also be aware that allergic reactions are possible. Severe allergic reactions to the ingredients in skin bleaching creams may include burning, itching, or lesions on the skin. The skin may also begin to flake or crust. Any uncomfortable reactions in the areas where the cream has been applied should be reported to a doctor immediately, and be sure to bring the product with you when you visit your doctor. Discontinue use of the product if you are using the cream at home. Mercury is also commonly used in skin bleaching creams. Mercury has been linked to neurological damage, kidney problems and birth defects, according to an article in NaturalNews.com. Arsenic is also an ingredient that is found in some skin whitening products. Arsenic, of course, is poisonous. It is found in pesticides, and can cause cancer in the lungs and other organs. Be sure to check labels for terms containing "arsenic." The word arsenic may be joined or hyphenated with other word (for example, arsenic-oxide or arsenic oxide). There are natural substances that you can use to lighten your skin or reduce the appearance of stretch marks or other skin discolorations. One common method is using lemon juice. Apply several times a day to the area that you would like to lighten. Women who have medium to dark complexions should understand that their complexion is part of their own natural beauty, and lighter skin is no more beautiful than darker skin. In some cultures and in ancient times, lighter skin was and still is considered a sign of aristocracy because laborers work outside and have tans or darker complexions. In American society, tans have long been in vogue. No matter your complexion, whatever the skin that you may be in, it is beautiful and should be cherished. Do not sacrifice your health for beauty, because skin bleach dangers are real.